EDITOR’S NOTE: Companies introducing new product at the Fort Lauderdale boat show like to do so with a splash, so the first few days feature a busy schedule of press conferences and media events. More than 1,500 boats were on display. 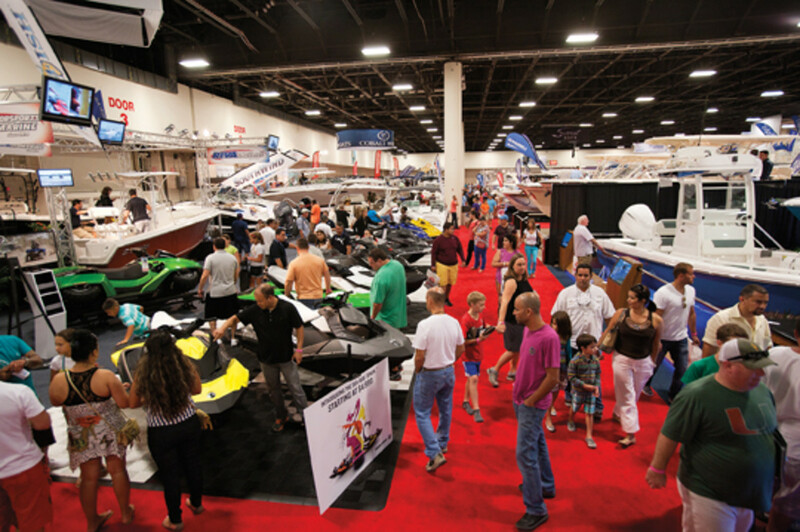 EDITOR’S NOTE: Companies introducing new product at the Fort Lauderdale boat show like to do so with a splash, so the first few days feature a busy schedule of press conferences and media events. Executive editor Chris Landry was part of the Trade Only team making the rounds. Here are some of his observations. Raymarine took its show offsite Wednesday to showcase its latest navigation technology. The electronics company rigged a Boston Whaler 320 Outrage at the Hilton Marina with a helm bursting with navigation technologies, including the latest version of its operating system — LightHouse II, for all of its multifunction displays. On release of LightHouse II, Raymarine users will have the option of navigating with free raster and vector charts of the United States by downloading the charts from www.raymarine.com. Here was the setup on the Whaler: An e125 12.1-inch display and a 7-inch display were mounted on the boat’s leaning post, facing aft, to showcase the new software and charts. At the helm were twin e165s with 15.5-inch displays and a Raymarine p70R autopilot controller with a 3.5-inch screen. Active Interest Media’s Marine Group hosted a meet-the-editors day, giving companies a chance to present their latest products. Those that attended included Interlux, Vessel Vanguard, Simrad, Horizon power cats and Kanberra Gel, ACR and Imtra. I attended a few of the sessions. Mikele D’Arcangelo, marketing director of ACR Electronics, presented a couple of new products — the Firefly Pro SOLAS ($88.99) and Firefly Pro Waterbug ($99.99) strobe lights with LED illumination. The previous version used Xenon lighting. With the switch to LEDs, battery life has increased from 8 to 56 hours. The light is brighter now, has an SOS strobe and costs about $10 less than the previous version. D’Arcangelo showed us the RapidDitch ($79.99), a new ditch bag from ACR with added buoyancy, a single-zipper center opening and two shoulder straps that can be used as tethers in a man-overboard situation. It also has a waterproof pocket, as well as a center broad-reflectivity ribbon. Regulator&apos;s Joan and Owen Maxwell on their new 25-footer. I caught part of Imtra Marine Products COO Eric Braitmayer’s presentation. He told us that the company is pushing new Side-Power boat stabilizers with hydrodynamic adjustable fins. They make a good fit for boats from 42 to 65 feet. He talked about the importance of selling an entire hydraulic solution: the fin stabilizers, bow and stern thrusters and a windlass. Putting these components together piecemeal costs more. “We want to sell solutions and help people with making the right choices,” Braitmayer says. The company’s sales force of 10 has the technical knowledge and skills to service the products. Braitmayer says the company also offers a full line of pilot seats from Norsap. I stayed put at the W Hotel and attended a press event that MarineMax hosted. Chairman, president and CEO Bill McGill says his company is pressing forward during the next year, armed with quality brands that include Sea Ray, Azimut, Hatteras, Scarab, Cabo, Grady-White, Meridian and Boston Whaler. Boats range from 11 to 100 feet. McGill and several other MarineMax executives also talked about new boats from the company’s 11 brands. 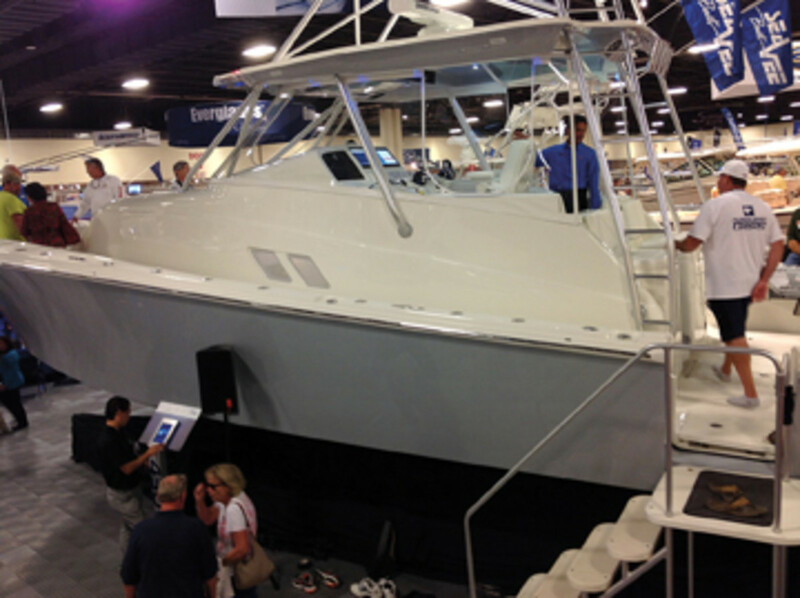 Across the showroom sat the new SeaVee 430 Fish Around — a hybrid of an express fisherman and a center console. 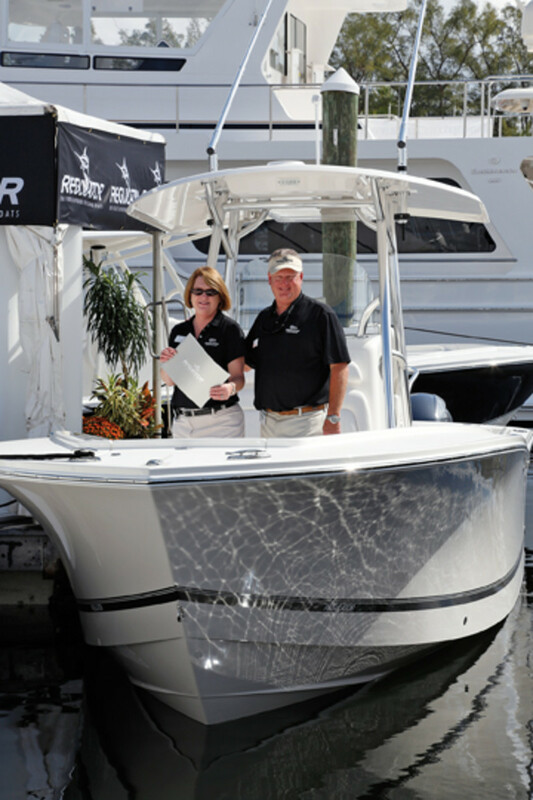 Regulator Marine marked its 25th year by introducing a 25-foot center console — the Regulator 25. It replaces the legendary 26, which was Regulator’s first boat. The company has constructed 1,525 of the 26s since their introduction in 1991. Twin Yamaha 200-hp 4-strokes power the new 25, making for a fuel-efficient package. The SeaVee 430&apos;s live well. Regulator is focusing on growing its dealer network. “We are working hard down here in Florida and making some inroads with great Florida dealers,” Maxwell says. I also talked to Maxwell’s husband, Owen, co-founder of the company. He told me that a new 23-foot center console will be introduced at the Miami International Boat Show. After that, a center console of more than 40 feet may be on the horizon, he says. Tiara Yachts unveiled its 50 Coupe — the sedan sport cruiser that marks the beginning of its next generation of yachts, says CEO Tom Slikkers. The 50 Coupe has an all-around modern look to it. The interior furniture and hardware are contemporary for the most part. But you still get the fundamental traits of a Tiara, Slikkers says. The 50 also stands out as the first production boat with Volvo Penta’s Glass Cockpit, a system that collects engine, systems and navigation data and feeds it to multifunction displays at the helm. In all, Tiara had eight boats at the show, and its sister company, Pursuit, had nine. Baja Marine held a two-pronged event. First, company president John Walker and vice president Nick Miller presented the Baja 26 Outlaw with a twin-outboard propulsion package instead of the typical sterndrive power. The outboard installation (a pair of Mercury 300 Verados) frees space in the stern for a storage compartment that holds a wakeboard rack and safety equipment. 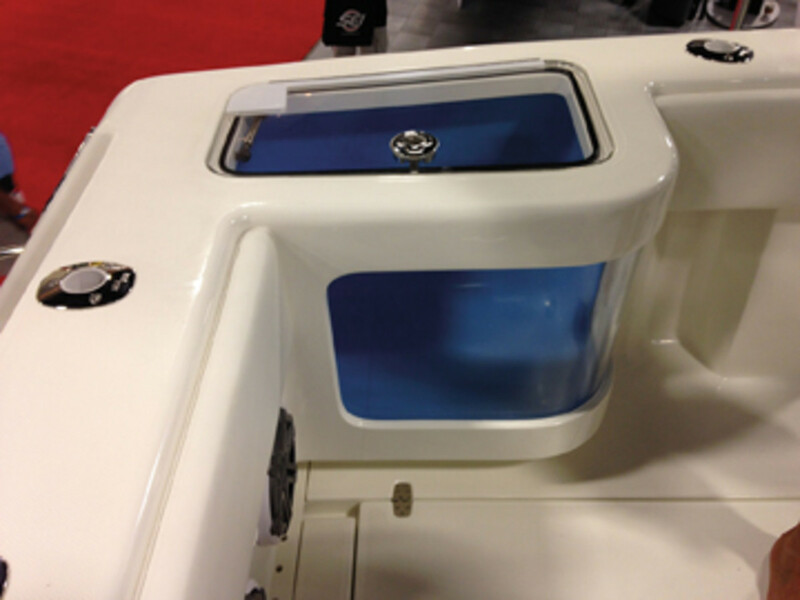 Next, we checked out a special version of the Pro-Line 23 center console — the 23 Sport Hemingway Edition. This will be the first boat in a series of vessels designed with descendants of Ernest Hemingway. Two of the writer’s grandchildren — John and Mina — attended the event. “Anyone who has read the novels by my grandfather knows he had a great passion for the water, boats and fishing,” says John Hemingway, a writer and journalist himself. Between events, I snuck back to my hotel room and let colleague Rich Armstrong cover the unveilings of the 350 Outrage and 345 Conquest from Boston Whaler. I was planning a visit to check out the builder’s Dauntless fleet the next day and I needed to get a head start on writing articles and producing a video for the next day’s e-newsletter. Next up was Sea Ray’s event. With fireworks and an extravagant indoor display, Sea Ray introduced its 510 Fly and 350 SLX. I was able to hook up with Ron Berman, Brunswick vice president of product development and engineering, to get the lowdown on these two vessels. The 350 SLX and 510 Flybridge are new-from-the-keel-up boats, Berman says. “Right now, Sea Ray is investing probably at the highest levels in the history of the company,” he says. The 350 SLX is the largest bowrider Sea Ray has ever manufactured. It can seat 18 people, according to Berman. The 510 Fly touts a new Cummins docking system with a joystick that works with the inboards and a bow thruster, Berman says. He explains how the flybridge buyer differs from a Sundance buyer. “The flybridge buyers are looking for more interior accommodations and love the view you get on the flybridge,” Berman says. I have written articles about the new Dauntless fleet from Boston Whaler, but I was eager to check out all of the boats myself and the builder held another press event specifically for these launchings. Boston Whaler has added two models to the Dauntless line — the 210 and 240. These boats, more than any other Boston Whaler center console, deliver the goods for multiple inshore boating activities. Whaler during the past two years has been working to build an all-new Dauntless family. It started with the introduction of the 17 Dauntless 18 months ago, followed by the debut of the 270 Dauntless at the 2013 Miami International Boat Show. All five made appearances at this boat show. The Vicem 107 Cruiser, the largest yacht in the builder’s semi-displacement cruiser line, is also the largest boat I boarded at the show. The Vicem line consists of traditional-looking and styled yachts. However, the owner of this 107 preferred contemporary interior styling. In the saloon, no doors or knobs are exposed. Instead of handles, small, subtle buttons engage electric magnets to open entryways and cabinets. This theme is consistent throughout the yacht. The wood bulkheads and doors were cut from the same tree with uninterrupted grain. I saw the clean, brightly lit engine room, with its twin 1,500-hp C32 diesels from Caterpillar. The ZF Marine joystick docking control integrates the engine drive system with the bow thruster. The three-deck yacht includes five guest cabins, three heads and a day head. I found a hot tub, a wraparound settee with table and a bar on the upper deck. There are also plenty of lounges for sunning. At the convention center I was able to examine the twin-step bottom of the SeaVee 390 Z — I had already interviewed naval architect Rob Kaidy, whose company, Ocean5 Naval Architects, designed the bottom. Now I had a chance to put the SeaVee/Ocean5 stepped bottom to the test. Kaidy had explained that a stepped hull allows the vessel to maintain its optimal running angle for the most efficient ride. We had 500 gallons of fuel and a two-person crew. The captain of the SeaVee during my sea trial was Art Sapp, a charter captain the builder hired to drive the 390 Z. We motored through Port Everglades and into the ocean. I took the wheel and punched the throttle, reaching a top speed of 63 mph. She was on plane with little bow rise in five or six seconds. The SeaVee remained on plane at slower speeds. I had her down to 17 mph. At 45 mph (4,500 rpm) the boat, with its triple 350-hp Yamaha F350s, can travel 0.9 miles to the gallon. At 61 mph, it gets 0.7 mpg. I ran the SeaVee in every direction to the sea. The hull and engines stuck when making high-speed turns. Kaidy had told me that poorly designed stepped hulls will slip or slide during such turns. The boat was outfitted with the Optimus power steering system, which gives you the ability to set lock-to-lock steering. Our boat was set at 3-1/2 turns at low speeds and seven at high speeds. The system automatically switches back and forth. Editor Bill Sisson had arranged for me to test a new 45-foot cat from American Marine Design of St. Mary’s, Ga. — the Insetta 45 with the much-hyped Seven Marine 557s for power. I met company president Robert Presby, who used to work for Boston Whaler in its design, R&D and construction areas. The boat is built with fiberglass, vinylester resin and composite core material. Vacuum infusion technology is used to construct the Insetta 45 — impressive for a seven-employee operation. Unfortunately, I had little time before the next assignment, and reaching the Atlantic would take a good 30 minutes. I was able to test the boat in a short stretch of the Intracoastal Waterway that allowed high-speed operation. I had just enough space to get the Insetta up to about 55 mph. The engine, with a displacement of 6.2 liters, is much bigger than its competitors — and it sounds bigger, too, with a deep and throaty resonance. Mid-range acceleration was impressive, and the power steering system worked flawlessly. She hits 60 mph at the top end right now, but Presby told me the engines need different props that should allow the boat to reach 65 mph. American Marine Design, founded in 2007, has designed the boat for both offshore fishing and day cruising, with lots of deck space and storage (the beam is 11 feet, 8 inches). The first Insetta 45 was powered with four 300-hp Mercury Verados. Performance with the four Verados is comparable to that of the Seven Marine-powered boat. Each gets about 0.85 miles to the gallon at about 30 to 45 mph. With the prop adjustments, Presby says he thinks the boat can get 1 mile to the gallon. A fully outfitted Insetta 45 with the Seven Marine 557s is $557,000, which is about $50,000 more than the boat with four 300-hp Verados. I always have time when I get the chance to interview a boat company executive. Andrea Sculati, of the public relations company Studio EffeErre Italy, set up an interview with Paolo Casani, CEO of the Azimut Yachts division of the Azimut-Benetti Group. During a 45-minute talk, Casani covered a lot of ground. Azimut Yachts now consists of five brands or collections — Magellano, Atlantis, Grande, the Azimut S Collection and the Azimut Flybridge Collection. “We’re not just selling a yacht. We are selling a lifestyle,” Casani says. Azimut aims to improve its presence in all of these locations.